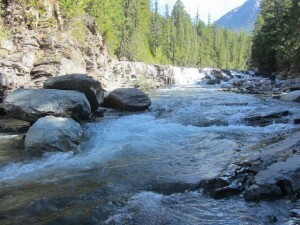 The beauty continues when we cross from Canada to Montana USA and visit Glacier National Park. 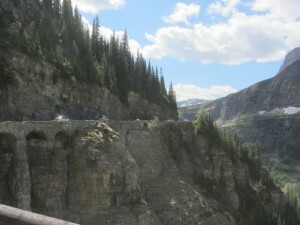 The main road through is the Going to the Sun Road. It’s only open during summer and we get there just two weeks before it closes for the season. 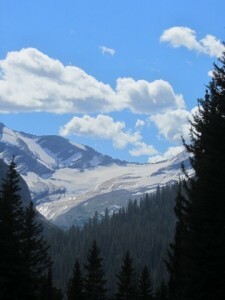 There aren’t many glaciers in the park these days but that doesn’t detract from its magnificence. 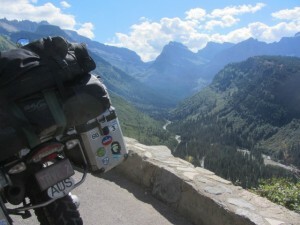 The road is a terrific ride and there are plenty of places to pull over and enjoy the view. It’s not a race to the end but a chance to savour the scenery. Lake McDonald is breathtaking from every angle. High up the road you get spectacular views down in to the valleys below. There are road works in the park but being stuck waiting for the pilot car isn’t an inconvenience – it’s just an opportunity to enjoy the view. 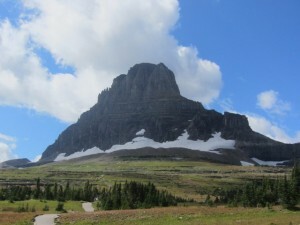 The peak of the park – Logan Pass is more than 4000 feet. With scenery like this no wonder we love this part of the world. 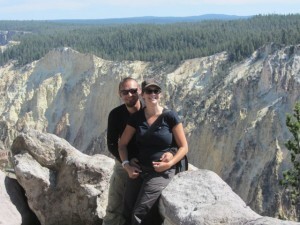 Nicole and Christian - our landy buddies! 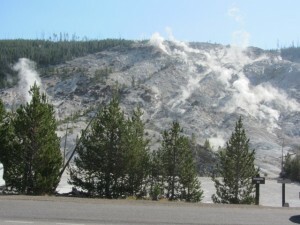 We don’t expect it to get better but it does when we arrive at Yellowstone National Park. We are delighted that Nicole and Christian, two of our travelling companions to Prudhoe Bay in Alaska are heading this way and we’ll be able to see them again. 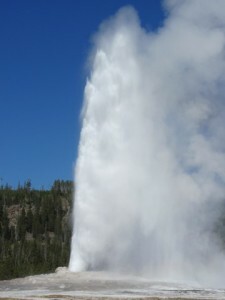 Yellowstone is famous for its geysers – especially Old Faithful but there is so much more. We spend a day touring the area with Nicole and Christian. 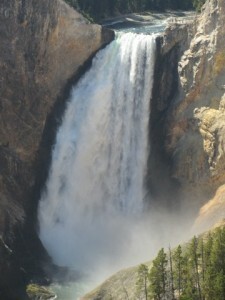 The Yellowstone Canyon isn’t quite the Grand Canyon but it is incredibly impressive. But for us it is the wildlife that we love. 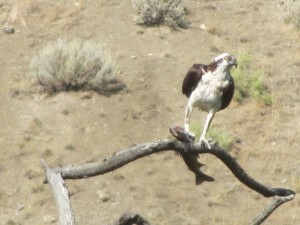 We’d only been in Yellowstone a few minutes when we saw this osprey with its catch of fish. 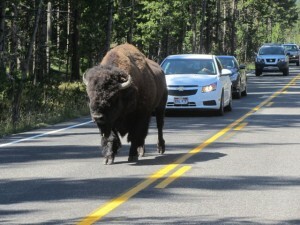 And then we saw bison feeding on the side of the road. 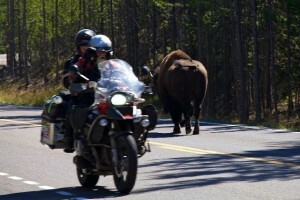 We don’t have to travel to see the wildlife. 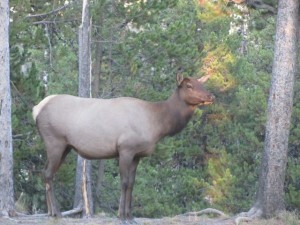 The elk graze in our campground. 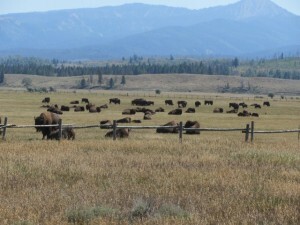 In the centre of the park we saw herds of bison. 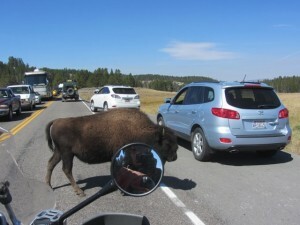 One giant one was just strolling along the road, holding up the traffic, without a care in the world. And this one took a turn across in front of us. Lucky there were in a good mood. One shove from these beasts and we’d be history. There are warnings everywhere to keep your distance but that is a bit hard to do when they make a beeline for you! 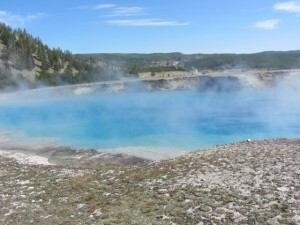 The geyser fields and the turquoise lakes created by the volcanic activity in the area are breathtaking. It is a place of great beauty. 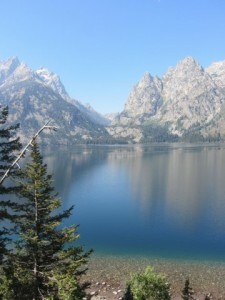 South of Yellowstone is the Grand Teton National Park. We rode the loop trail through the park. 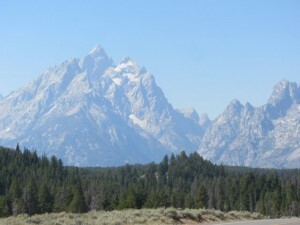 On one side are the Grand Teton’s and their ever diminishing glaciers. 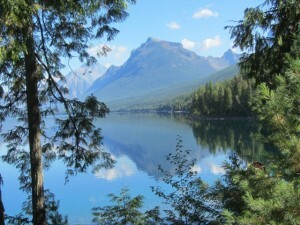 And Lake Jenny with its crystal clear water offering up reflections of the surrounding mountains. 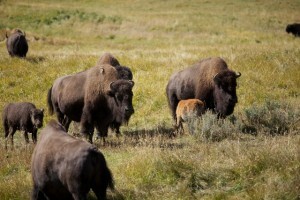 The broad plains are home to even more bison…literally hundreds of them. 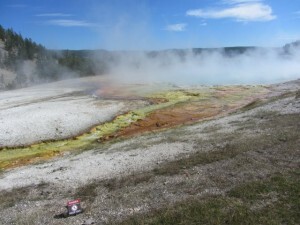 There are plenty of bears in Yellowstone and Grand Teton but the rangers had closed off areas to allow the bears to eat in peace. They were preparing for winter and needed all the time to eat their fill. It’s a sad day when we say goodbye to Nicole and Christian. They are staying in the west and we must move east. We know our paths will cross again. They are magnificent travelling companions and now they are good friends.